***** A combination of growing up in the 1980s golden age of Jeremy Lloyd and David Croft sitcoms and another theatre reviewer recently telling me that a production of ‘Allo ‘Allo was the funniest theatre show they have ever seen meant I was very excited to be in the audience for Tudor Players’ opening night of the production. “Listen (read) very carefully, I will say (write) this only once.” ‘Allo ‘Allo introduces the audience to Rene and his wife who have stashed a priceless portrait in a sausage in their cellar, where two British airmen are also hiding. Communications with London via a wireless that is disguised as a cockatoo add to the chaos. Meanwhile, news that the Fuhrer is scheduled to visit the town inspires tricksters disguised as Hitler to frequent the café. The audience will discover if Rene can summon all the wit he can muster to save his cafe and his life. As the iconic ‘Allo ‘Allo theme tune provided the perfect intro to the play, looking around me I realised I’ve never spotted the Library Theatre so packed for an opening night, proving both the audience’s love for the original sitcom, comedy overall and the growing reputation of Tudor Players. Marcus Newman as Rene rightfully gave by far the best performance of the night, perfectly channelling Gordon Kaye, capturing his voice, tone, body language and attitude, whilst making the character his own and displaying superb stage presence and charisma throughout. In a production where the entire cast wonderfully captured the accents, tone, looks and personalities of their characters, other cast members I must praise are Phil Gascoyne as Gestapo officer Herr Flick and, successfully pulling off the most distinct bad British accent and pronunciation in the history of sitcom, Joe Thompson as Crabtree, who along with Marcus most delightfully captured their television equivalents. I must also mention Andrea Howard as Rene’s wife Edith, who was at her best when brilliantly capturing her character’s terrible out of tune singing voice; and amongst the extras the two gentleman playing the British airman, who were definitely inspired by Armstrong & Miller’s own airmen creations. In addition to director Phil Gascoyne whose hard work brought this production to life, from the backstage team, I must especially praise Hansel D’ Roza for the cleverly designed set, especially capturing the look and feel of Café Rene, which led to clever and almost seamlessly set changes between scenes; the props team especially for the cockatoo radio, German chastity belt and the essential “Fallen Madonna with the Big Boobies”; and Paul Kelly for the lighting, especially during the cinema screen bringing the light of the imaginary projector and screen to life. Having the audience in stitches from the very beginning, everyone involved fabulously brought the style and comedy of the classic sitcom and words of Lloyd and Croft to life on stage, more than meeting the words of the show’s programme in delivering an evening of “classic farce, slapstick and visual gags, hilariously ridiculous accents, and of course plenty of sexual innuendo.” Also unlike the television episodes which never seemed to have a satisfactory conclusion, the finale of the play is hilariously and chaotically satisfying. 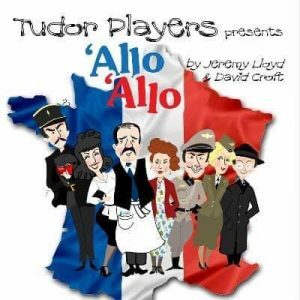 The production should not be missed by fans of classic British sitcoms at their best and continues to prove that Tudor Players are one of, if not the best, theatre company in Sheffield at bringing hilarious comedy to life on stage. ‘Allo ‘Allo will be performed at the Sheffield Library Theatre at 7.15pm until Saturday 16 February. Tickets are £10 full price and £9 concession. To book visit www.tudorplayers.net. A leading Sheffield amateur theatre company for over 50 years, Tudor Players, named after Tudor Way where the Library Theatre is located, present three full length plays a year. Their two remaining plays in 2019 are Cheshire Cats from 14 to 18 May and A Chorus of Disapproval from 15 to 19 October, all at Sheffield Library Theatre. For further information and to book visit www.tudorplayers.net.